Preheat oven to 325 degrees F. Heat the oil in a non-stick skillet, and sauté the onion for 2–3 minutes or until soft and translucent. Add the salt, pepper, and salmon to the skillet, and toss to combine. Remove the pan from stove top, and let the mixture cool. Place ramekins on baking sheet; bake 25 minutes or until a wooden pick inserted in centre comes out clean. Garnish with green onions, if desired. Eat More = Get Stronger? We always tend to think to get better, we need to eat less. This isn’t necessarily true. Yes, portion control is important (see more about this topic on Friday), but it’s more about eating the RIGHT types of foods, and WHEN you eat them. For example, if you keep a traditional work schedule (9-5), then you’re better off eating a medium sized breakfast, a larger lunch and a light dinner. These of course depend on the type of work you do (office vs. physical labour) and your general health. People who have blood sugar issues, either too high or too low, often tend to fair better with 5-6 smaller meals a day, rather than the traditional three. What I’m trying to get across though, is the importance of having something for breakfast/morning meal. Personally, I’m not crazy about eating when I first wake up, but I’ve been trying to get in a early morning “meal” of some hot instant oatmeal when I get to work. This way, I’m still having some good whole grains as a morning meal, to power me through until lunch, but I’m not eating it right when I jump (read: crawl) out of bed in the morning. Additionally, eating the right kinds of foods, high in protein and “healthy” fats, will help you build more lean, strong muscle mass when you do get that exercise I was yammering about on Monday. Today’s recipe will help in these areas, as 1) It’s a breakfast/brunch dish 2) It contains eggs and salmon, which are full of heart healthy omega-3 fatty acids and 3) Each mini frittata packs about 17 grams of protein each, and almost no carbs! Plus, cheese and eggs taste great together and may help combat osteoporosis, as the calcium in cheese is more easily absorbed into the body with the addition of vitamin D-rich eggs. So I think I’ve pumped you up enough for one day. Here are the goals for May, June and July. Come back tomorrow for August and September! 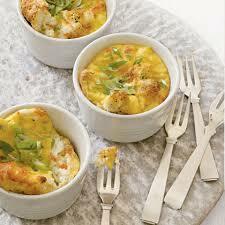 Find ways to kick-start the day with new, creative breakfast ideas. It doesn’t have to been traditionally breakfast fare, what’s important is balance and nutrition. It’s (supposedly) warm out! Get outdoors and work on building up some of that long, lean muscle! Learn how to add heart-healthy fats to your diet, like olive oils, avocados, nuts, seeds and fatty fish such as Salmon, Tuna and Trout. A San Francisco cable car holds 60 people. This blog was viewed about 1,500 times in 2014. If it were a cable car, it would take about 25 trips to carry that many people. Here’s an easy one-pot meal with freekeh, chicken, parsnips, carrots, prunes, rosemary, thyme, tons of garlic, and broth. Don’t worry about the amount of garlic cloves that this recipe calls for though. Because the cloves are left whole, you get a more mild garlic taste, plus the whole cloves become sweet when braised. The prunes made a rich marriage between sweet and savoury, plus the tender chicken and chewy grain give you all the great texture! Preheat your oven to 345 degrees F. In a Dutch oven, or any oven proof pot with lid, pour the freekeh and broth in. Place in the oven for 10-15 minutes. Remove the pot from the oven (careful, it will be hot!) and add all of the remaining ingredients in the pot making sure that some of the prunes and onions get into the liquid below the chicken. Drizzle a little olive oil on all ingredients. Place lid on and put in the oven on the middle rack. Drop the heat down to 200 degrees F and cook for 1 hour. 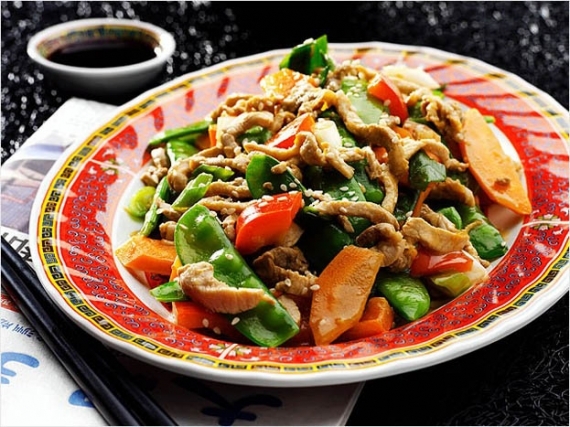 Check on it, give it a stir, and cook until the chicken is fully opaque, and vegetables are tender. This is usually only about another 15-20 minutes. Note: Cooking times vary. For added browning, remove the lid for a few minutes during the final cooking stage. If you notice the freekeh becoming too dry, you can add more broth or oil at your discretion. * To learn how to properly clean and check grains, prunes, rosemary and thyme, click here. Healthy Habits – Gear up for Grains and Cooking! Okay, personally, I love the tips for March and April. I mean, who can resist encouraging people to cook more? Admittedly, there was a time when I ate out almost every meal. Besides the financial cost (which is staggering), you don’t realize how much more fat and sodium is in a restaurant meal in comparison to a home cooked one. The reasons are pretty simple, other than of course that fat and salt taste good (sorry, but they do!). A restaurant may use pre-made mixes and seasonings, full of sodium, MSG and a whole slew of unhealthy additives. Additionally, you may only use a teaspoon or so of oil at home to saute your veggies, but I can assure you, the restaurant is using a whole lot more. So, to combat this tasty, tasty enemy, we need to do more of our own cooking. Nothing complex or crazy, just simple, good, home-made meals. Yes, you can still eat out, I’m not banning you from your take-out menus, just try and keep things a little more in balance. The third Healthy Habits is to cook at least 3 meals more per week than you are now, even if that means cooking breakfast or lunch. Try checking out some of the crock-pot meals that I posted a while back (check out the archives, dates 8/25 through 9/5) for ideas on how to prepare a great meal ahead of time. April – Go for Whole Grains! The Canadian daily food guide says that an adult female (19-50 years old) needs 6-7 servings of Grain Products a day (8 for males). What does your intake look like? 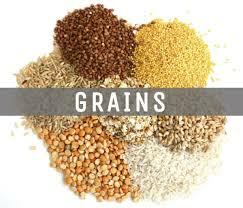 Try and add at least 3 servings of whole grains to your daily diet. 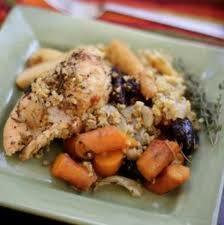 See today’s recipe for Freekeh Chicken! Tomorrow? May, June and July! This spicy soup definitely counts as eating healthy! With onion, green pepper, celery, carrots, corn and of course black beans, it has you on track for upping your veggie intake! This soup will serve 6-8 people. In large pot, heat the oil over medium heat. Add the onion, garlic, celery, green pepper and carrots, and cook, stirring occasionally, for 5 minutes or until onion is softened. Add the chili powder, thyme and cumin; cook for about a minute, stirring occasionally so nothing burns. 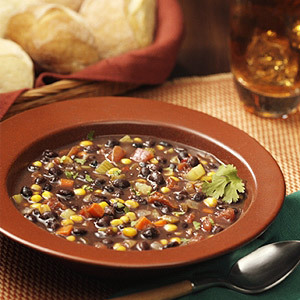 Add the stock, 1 ½ cans of the beans, corn, and pepper, and bring to a boil. Meanwhile, in food processor or blender, puree together tomatoes and remaining 1 ½ cans of beans. Add these to the pot. Reduce the heat, cover the pot, and simmer for 10 to 15 minutes or until vegetables are tender. Serve hot, with a quick squeeze of lemon/lime juice to each bowl. Healthy Habits – A Year to Get Better! Okay, I am not one to talk. I have some pretty horrendous habits of my own. But…. with New Year’s coming this week, I should at least try and work on getting somewhat on track. One of the things that I hate about New Year’s resolutions, is that everyone is so gung-ho to make them, and then a week in, they’re gone! I think the problem is multi-fold. 1) We choose to change TOO much. 2) We say we need to make the changes IMMEDIATELY! 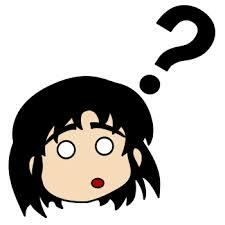 3) We loose motivation when there is no instant gratification or reward. So how do we go about solving those problems? First off, don’t get caught up with the world’s need to have everything changed and different as of January 1st. It’s not going to happen buddy… you’re only going to disappoint yourself. Makes small changes, gradually. That way you don’t throw your body into shock, and you’re not dealing with cravings for EVERYTHING you gave up all at once. So here’s what I suggest: This week I’ll be posting 2-3 ideas for change a day, and giving them a month to take them on, i.e. : something to do in January, something to do in February, etc. By the end of 2015, if you stick with it, you’ll see you’ve come an incredible far way, and it didn’t seem too bad along the journey. Ready? Here goes! The Canadian daily food guide says that an adult female (19-50 years old) needs 7-8 servings of Vegetables and Fruit a day (8-10 for males). What does your intake look like? Try and add at least 3 servings of vegetables and fruit to your daily diet. Come back tomorrow for March and April! Personally, I’m not a huge “almond flavour” person. I hate marzipan! My caveat however is this recipe! I LOVE these cookies. There is just something about them that is so delicious and not overly sweet. Traditionally, this recipe would call for the use of lard. For obvious reasons, lard would not work for me. The compromise here is to use half butter/margarine and half Crisco/vegetable shortening. You can use 100% of either, instead of a mix, but I find the mix works best. This recipe makes 4 dozen cookies. Preheat oven to 325 degrees F. Sift flour, sugar, baking soda and salt together into a bowl. Cut in the butter/margarine until mixture resembles cornmeal. Add egg, almond extract and food colouring. Mix well. Roll dough into 1-inch balls. Set them 2 inches apart on an un-greased cookie sheet. Using the bottom of a floured glass, gently press down the cookies to flatten them, to about a ¼ inch. I don’t suggest using your fingers, as they will leave grooves in the cookie that the egg wash will settle in. 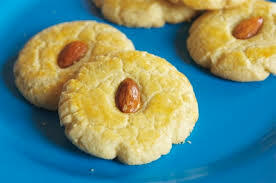 Place an almond on top of each cookie and press down to slightly. Brush each cookie lightly with the egg wash. Bake in the preheated oven until the edges of the cookies are golden brown, 15 to 20 minutes. Remove to a rack to cool. Enjoy! So we’ve already talked about how it’s “traditional” for Jews to go out for Chinese food on Christmas Eve… but what else is there to do? Admittedly, it’s a strange feeling being surrounded by hoards of people all bursting with the holiday spirit, but for me, it’s just a Wednesday. Kind of a let down, no? I get a little jealous when I see the bubbles of joy floating around people as they walk down the street, wearing Santa hats. I like to think that if I celebrated the holiday, I’d go all out! I’d have my tree and Santa hat out by the end of Thanksgiving. Then I start to think. You know what? 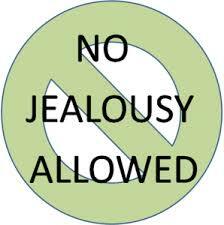 I really have nothing to be jealous of. Feelings of goodwill are not limited by religion. Yes, I live in North America, where Christianity is the main religion, and that means that everywhere I go, those are the holidays that will be displayed and celebrated. But that doesn’t mean that MY holidays are ignored. In Toronto, come Rosh HaShannah, Bathurst Street (one of the main thoroughfares of the city) is bedecked in signs wishing everyone a happy new year, and there are ads posted selling schach (leafy roof covering for the Sukkah during the holiday of Sukkot), on every telephone pole. This time of year, there is the annual Chanukah caravan parade, that drives through the main streets of town blaring music and cars decked out with Menorahs lit up on their roofs. So what does this all mean? It means that even though we are not celebrating tonight, it doesn’t mean that we won’t get our chance. We thank G-d for living in a land such as Canada, where there is the freedom to worship as you desire, and that everyone gets the opportunity to feel that bubble of goodwill; be it tonight, or back in September. This dish is called a “Happy Family” because it is blend of all different ingredients, coming together to make something delicious, much like how a family is. This recipe can easily be converted into a vegetarian dish by substituting tofu for the chicken. You can also use beef instead of chicken. This recipe makes about 8 servings. Combine the ingredients for the marinade and pour them into a large freezer bag or a bowl that you can marinate the chicken in. Add the chicken pieces and toss to coat. Let the chicken marinate in the fridge for at least an hour, or even overnight. In a wok or large skillet, on medium-high heat, add the tablespoon of oil and sauté the chicken pieces until they are cooked through. Remove them from the pan. DO NOT put them back into the bag or bowl that you were marinating in. That is a good way to get food poisoning! Just set the chicken (and any juices) aside on a clean plate or bowl. Next, add the ¼ cup of oil (or less) to the wok/skillet and add the onions and carrot. Toss to coat and let cook for about 2 minutes. Next add the peppers, tossing and allowing to cook for an additional 2 minutes. Next add the peas and mushrooms, then the water chestnuts, corn and bamboo shoots. Allow everything to cook together for another 2-4 minutes. Add the chicken back to wok/skillet. In a small bowl, mix together the ingredients for the stir-fry sauce. Make sure you have fully incorporated the cornstarch, so that it is not too lumpy. Pour the sauce over the stir-fry/chicken mixture. Allow the sauce to come up to temperature and you will notice it begins to thicken. Once it has done this, toss the stir-fry to cover everything in the sauce. Serve hot garnished with the green onions. This dish goes really well with rice or noodles. * To learn how to properly clean green onions, click here.